I am hosting my first ever Random Acts of Generosity this Saturday at Fabrica. It’s an experiment, part of the brief of being resident artist, and I am not sure how it will play out. Pre-booked participants will get 15 minutes of one-to-one with me, at the end of which I will give them a gift. And the rest is up to them. I won’t say much more, as that would constitute a spoiler! But am taking delight in the long list of potential ‘gifts’ I have and working out which ones to wrap, bring and label for the purpose. I think there are a few places left; you can book in via eventbrite or the Fabrica site. 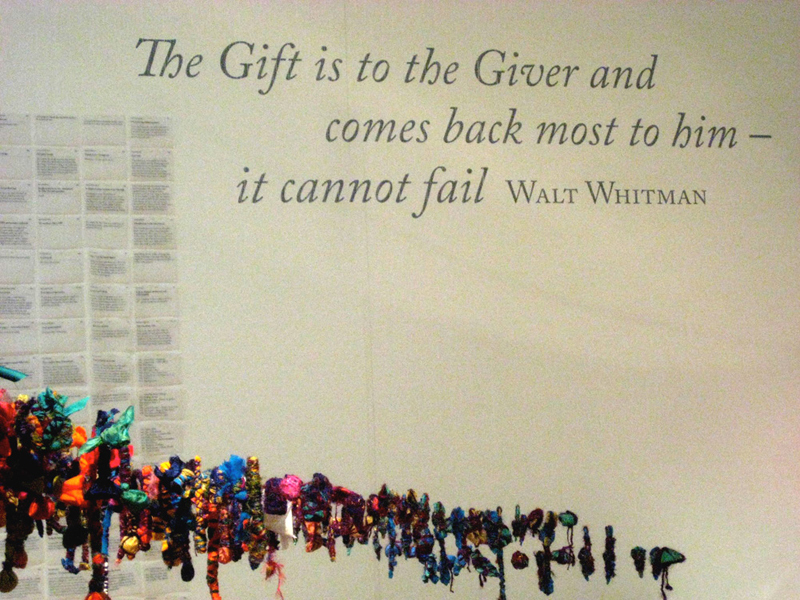 So, am I just a generous person who loves giving things away – or I am using others to further the ideas in my work? I was struck at the ‘There’s an ‘I’ in Altruism’ event I took part in at Fabrica in February – co-hosted by Science writer Marek Kohn, and alongside speakers from scientific, anthropological, tech and faith backgrounds – by one of the ideas that came up around the commodification of altruism, and how we have as a society turned altruism into a product like any other, for the profit and self aggrandizement of the ego and capital in general – subsuming our middle class guilt into direct debit payments to charities for example, who behave more like corporate institutions than representatives of the truly needy. The rotting effects of capitalism, exacerbating inequality and perverting the very idea of gift and charity into something meaningless and ineffective. Although I don’t share this view completely – as it seemed to write off in disdain most of the people in the room and the way they probably live their lives (a personal response on my part) – it did get me reflecting once again on how giving has become more associated with loss and profit than it has with connection and collective well-being, its apparent original purpose. And also these two of self –interest and generosity are supposedly opposing notions, when they eclipse and become interdependent; it is only then that a system of reciprocal altruism can really function. For example, although much of my own arts practice could be labeled as operating in the social, and encoded with the desire to connect and impact others in some way, I do projects like Burning the Books for dual reasons which are simultaneously about me and about impact on another/society. The first is stemmed in self-interest – I had an extreme experience around debt which shook my life up, then got curious about the social, moral and philosophical questions it raised and found a ‘tool’ (the idea of the project) to explore this more. Secondly, Interaction with others was contingent on making that idea work. I felt instrumentalised by the idea and compelled to share it further, based on the powerful response from those who were part of the first Burning the Books through Giving into Gift and then at Blank Gallery last year for Volume II. This is a form of creative interdependence and I think there are many arts practices which can be a model for what Charles Eisenstein calls ‘ the age of interbeing’ as opposed to ‘the age of separation’ which he believes we are moving through, discussed in his most recent book. (More on that later). In terms of making art that is dependent on an encounter or exchange with another, over which I only have a modicum of control, the main currency is attention and trust. Will those who come on Saturday trust me enough to receive in full what I have to give them and will I resist the temptation to offer them something that really has no strings attached ? 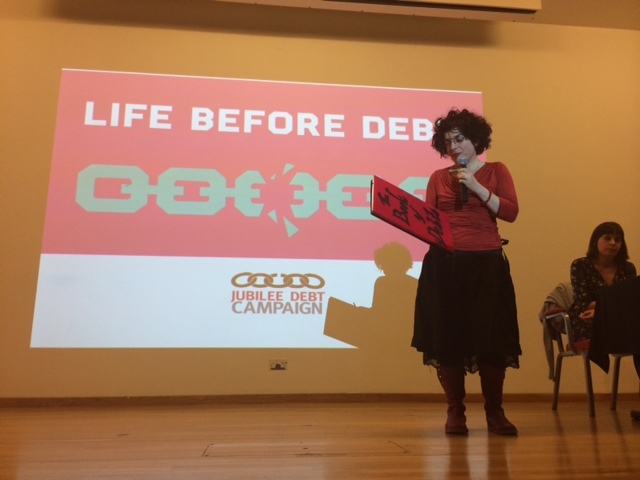 Last weekend I attended and presented The Book of Debts at Life Before Debt, a conference organized by the Jubilee Debt Campaign and hosted at SOAS. I have spent days now trying to get my head around how to communicate the density and complexity of what I learnt there, through a line up of inspiring speakers and delegates alike. I felt at the start of the project that debt was like a mountain and I had a teaspoon. Now it feels like a mountain range! And the highest mountain in view at the weekend, and percolating since then, has been the issues raised around unjust debts both sovereign (nation-based, institution-led) and household. I have spent a few years now wondering how to get past and shift the perception of debt as merely a financial issue, which can be a barrier to engaging with the project on first sight (I don’t owe money, or if I do I’m not telling you about it – I’m not guilty! arg!). Now, finally I was in the company of 400 other people who not only take the broader social, moral, political, psychological context of debt deeply seriously, but also have a lot of specialist knowledge of it. The emphasis was of course on economic justice and ways to work towards this, so this post focuses on what came up and struck me most on that front, and uses the language of that sector, which is dramatic, and provocative (and rightly so). Yes, there was plenty to be depressed about. Debt peril, debt slavery, financial colonization, mounting household debt and mental health statistics. But also it was an amazing space for gathering intelligence, feeling others commitment globally to work on a collective change and there were a number of solutions which came up too. At the closing, the incredible Njoki Njehu, grassroots organizer, ecological activist and women’s advocate of Jubilee South, gifted us with the story of the hummingbird gathering raindrops to help put out the forest fire, (see clip here). This was a really simple and helpful tale to take away for mitigating what could feel like an insurmountable task ahead for those engaged in challenging the fundamentals of the system, such as the way money is created – like the extraordinary Ann Pettifor who just published ‘Just Money’, another for my list to read..more on her later). Or just for facing and dealing with what is happening right now in society and how to approach and be gentler with one’s own self-expectations As the keeper of a Book of Debts, at this time in history, I need to hear more poetic nuggets like this, to avoid overwhelm and to remind myself in my own small but focused role in opening up dialogues with those I meet through the project and who engage with it on whatever level. There will be a film edited from the day, which I will link to when it’s up and will do a far better job than I can, of capturing the day.. The struggle over debt is the primary conflict of our times. Wall street predatory lending is an extreme form of usury. How does democracy survive when you are on the road to debt serfdom? At the opening he picked up on the questioning by Rowan Williams (former Arch bishop of Canterbury and author of some excellent speeches and articles on economy and morality) of the ‘we should always pay our debts’ morality (or psychological patterning) around debt which enables irresponsible lending to take place, borrowers to remain silent and in fear, and our entire system to now be built apon debt, with – as his students put it ‘ Our futures foreclosed’. 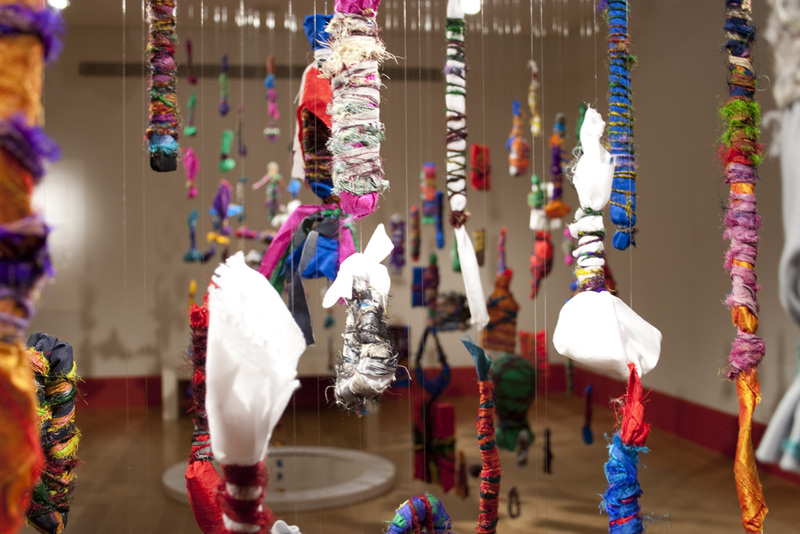 Both Andrew and Nyoki Nyehu, questioned the concept of forgiveness – and charity – in relation to socio-economic, unjust or odious debts. They said it should be a no-no as this implies there is something to forgive, a negative value, setting up a hierarchy, as then if your debt is forgiven, you owe the person who forgives you. It is not empowering and it adds a layer of indebtedness and the idea of payback. We could explore this in other areas of human behaviour and relationship too. They suggested the same could be said of charity (my Caritas ears pricked up!) ‘Charity suggests a judgement about the moral worth of the individual – that they need to be in need, to be helped’ i.e. that humans don’t have an automatic right to the basics of life. I want it look at this more. He talked about ‘the spiral of asymmetry’ re debt and credit and that all we can do is ‘limit the spiral’. He also mentioned the prohibitions of unlimited collateral, i.e. ‘Don’t take as security for a debt something that someone else needs, that is, don’t take the cloak that covers the back’ So then I thought of course of St Martin and tale of the ripped cloak. That will come later too, as I draw on this for my Isle Perdu Amiens commission. My head is spinning simply writing these words. So time to gather some raindrops and check The Book of Debts, which I am preparing for this Sundays Launch at Fabrica, Brighton 5 -6pm. 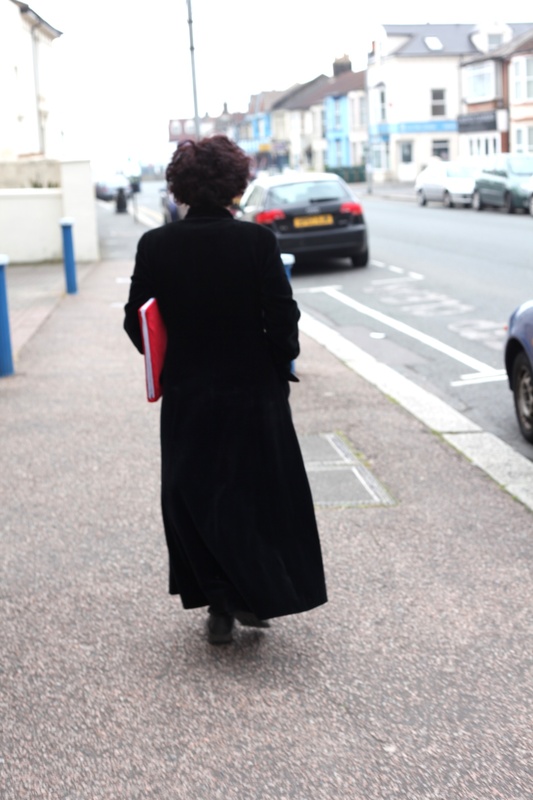 Full schedule of Book of Debts in Brighton and Hove also here. Preparing a verbal provocation to address an audience of academics, activists and faith practitioners on the spectrum of meanings and readings debt can have/ be next week at SOAS and ask them to contribute my next Book of Debts. Preparing a collection of top secret objects/experiences to ‘give’ away to random members of the public at Fabrica as a counterbalance to Burning the Books, which comes to the gallery soon. Working hard on balancing the childcare schedule between myself, my partner and other friends in need of childcare, that makes all this possible. As well as … preparing celebrating, in a quiet way, Nowruz, the Persian New Year, that begins today, the first day of Spring, in the absence of any other Iranians, apart from my partially Iranian children. And remembering my late, Iranian mother in the mix, who so loved this time of year. The personal and social are always enmeshed with the wider socio-political and the philosophical, I feel (as a human being, hopefully this resonates) I am always operating simultaneously on a number of intersecting and interconnected levels of consideration and sometimes it is hard to remember to see life as simple, which is what it is really. A question of breathing – and loving. And trying to focus on what is here, now – whilst keeping the bigger picture in view. A question of occupying the big world and the small world at the same time, local and global. Phew, there is a tension there. A balancing act. It is an exciting time and – in keeping with the ideas of balance and equality that are part of my enquiry – my life is reflecting my art and vice versa. 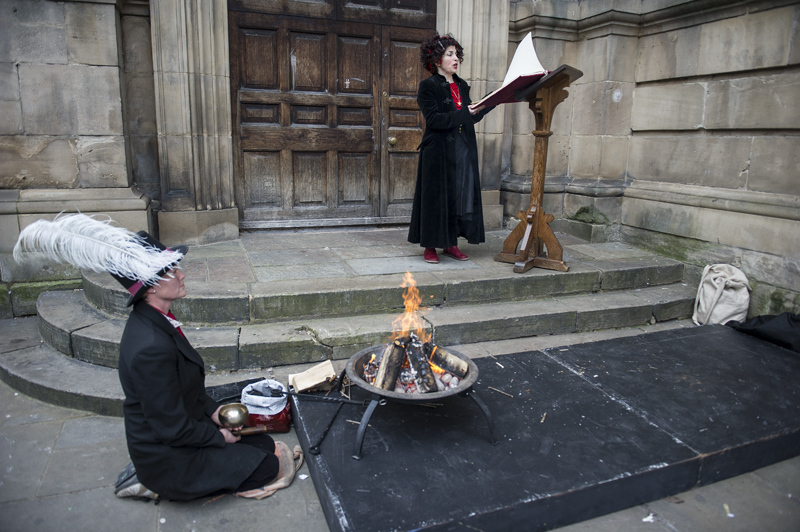 I have been very immersed in the first major tour stop for Burning the Books – which came to a fiery end in Birmingham Cathedral Square last weekend, to one of the most mixed audiences we have had so far. 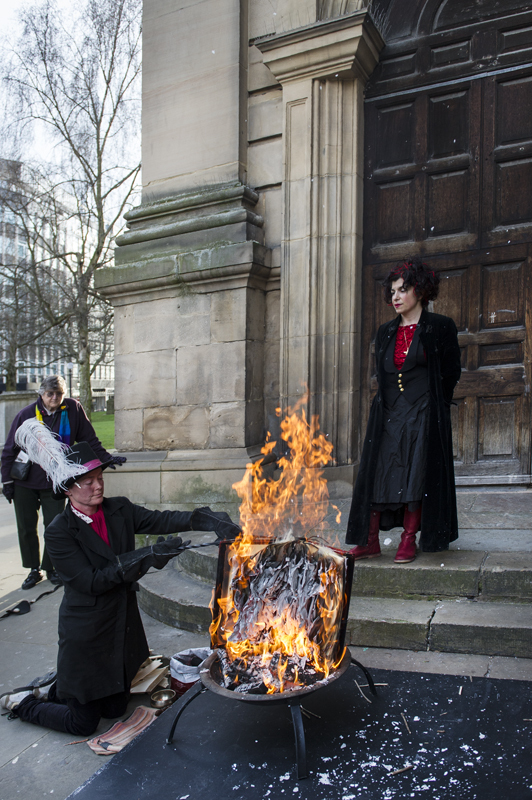 Burning the Books – Birmingham. Photo: Katja Ogrin. When I first went out with The Book of Debts in November 2011 in Liverpool, I went out as a ‘blank page’ – carrying a book of blank pages – and open to whatever came my way. The world has been changing rapidly since then, in particular the accelerating gap in socio-economic inequality, which gets reflected in the book and articulated by the stories coming my way and through the partnerships I have formed, such as the Jubilee Debt Campaign, who are hosting next weeks conference Life After Debt where we were supposed to burn the next volume of The Book. Due to red tape, we are now limited to presenting and gathering as UOL won’t permit burning on their grounds! And all stories will roll over to the Book of Debts, launching at Fabrica on April 6th (details here) which will really kick start that launch off with a series of globally and locally focused stories and issues, making it unique and already a provocative text for people to respond to and add their own entries to, I hope. And yet it is essential for me to prepare, cook, host and reflect on my mother’s culture and my own hybrid one at this time of year (whether there are Iranians around to identify with it or not). It is an occupying of a legacy, which enriches me – and my partner and the children also love it. (Giving them £5 notes wrapped in ribbon helps, one of the many traditions.). I am half -Indian on my Mother’s side. My maternal grandmother is an incredible woman who emigrated from India to Kenya, and then finally to Britain in the 60’s. This half of my identity is rich in culture – the food, language, traditions, Hindu religion are all a source of wonder for me. So, next, waking up in a really nice hotel, right next to the Cathedral, I went looking for the head of St John the Baptist there (or the ‘chef’ of John the Baptist, which might disclose how important the head/intellect is in French culture, the head is the boss!). An irresistible quest, which was apparently what prompted the construction of the biggest Cathedral in Europe. I felt the sunrise through window with the outline of the spires in dark relief before I set off, wandered through it with open mouth, and tried to walk the floor labyrinth to its centre ( but failed, too hard, loved to have seen or joined pilgrims shuffling around it on their knees, in a state of transcendence, or despair depending on whether they kept coming up against a dead end, like I did) . I was struck at the externalisation of mans desire to literally reach the heavens (let’s face it, it was men who went this big, at that time, with their big money, made from the blue of the woad plant!). A kind of beautiful bling in delicate stone, carved reliefs showing the story of John the Baptist, who was like Jesus’ mentor and baptised him (which means baptism predates Christianity ?) and then, just for telling Herod not to mess with his brother’s wife – but more probably because he started foretelling the Jesus as a rising star to trump Herod’s own celebrity – he had his head cut off, burnt his body, and well, the rest is a better known story. I read somewhere that John the Baptist ‘had a monopoly’ (on baptism, as it could only be done by him) and Jesus ‘had a franchise’. Interesting to think about religion as a kind of spiritual franchise.. BUT someone had the cunning thought to save the head, and it ended up in Amiens, and a version of it, if it ever was really saved, lies in this beautiful box, behind a grilled case in the wall. Tiny, like the Mona Lisa. Except he had nothing to smile about. He must have been a powerful orator, and what a threat is was – and still is – to speak your mind to the powerful! 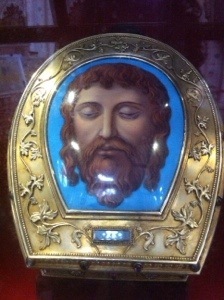 I later read that at least 5 other cities across the world claim to house the head of John the Baptist… what is is that is so powerful (for the faithful) about holy relics, even if unlikely to be authentic they still seem, as physical fragments of a teaching story so embedded in our cultures, to conjure something charismatic and magical. Ok, this is only the first 2 hours of my 3 day stay recounted! and it is past midnight. I will catch up on the rest later, my visits to the island, the Museum collection etc, after final meetings at the Library on the long train ride home! – Found out they do want me to come up with ideas to make a work (which had been hinted at) for a garden island they do projects on as part of the Hortillionages Festival and their own exhibition on Caritas. And then we will take it from there. 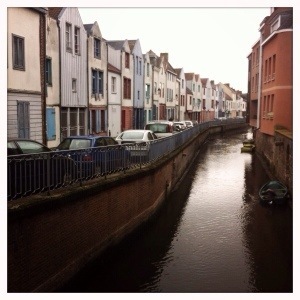 Coming to Amiens, speaking French again, stepping into the aesthetic of a beautiful historic place, eclipsed me into my past, as a 20 year old landing and living in Paris for 6 years – old style, a la boheme, the only model of an artist I had at the time, or was aware enough of to follow…And being ALONE in a city, at those rare times when I was not accompanied by Sophie, the Woad partnerships projects director from the Museum, exploring cultural, natural and historic spaces, (the HUGE cathedral, the museum of treasures, the streets and canals, touches of Venice and Amsterdam…) , eating out in restaurants at night with my research material as company, feeling totally at home and remembering how eating or drinking out alone in Paris 20 years earlier was always a more self-conscious affair, accompanied by a packet of very strong cigarettes, coffee and a sketchbook, charcoal hands and a belly full of desire to be and feel more visible, at ease, more loved. I have always found cities more a place of refuge in some ways than smaller towns or even natural spaces. 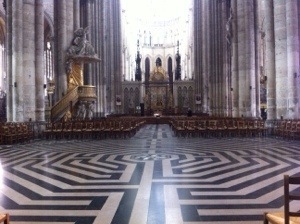 I get so high on, in particular, the cultural intake and transfer that occurs from walking into a jaw-dropping building like the Amiens Cathedral, the uncovering of streets I have never walked on before, brushing past strangers who I may never pass again, being able to understand snippets of conversation as they breeze past me, though not in my native tongue. Being both the guest of the Museum – with, I must say, two warm and brilliant women – Director Sabine and Woad project director Sophie – to feed me all the cultural, socio-historical background to the town and its culture that I could possibly want, and more – and also being able to speak French has given me kind of autonomy and immediate access to some of the wider story of this city. And I love to experience new places, through their wider stories – or at least the version that first presents itself. 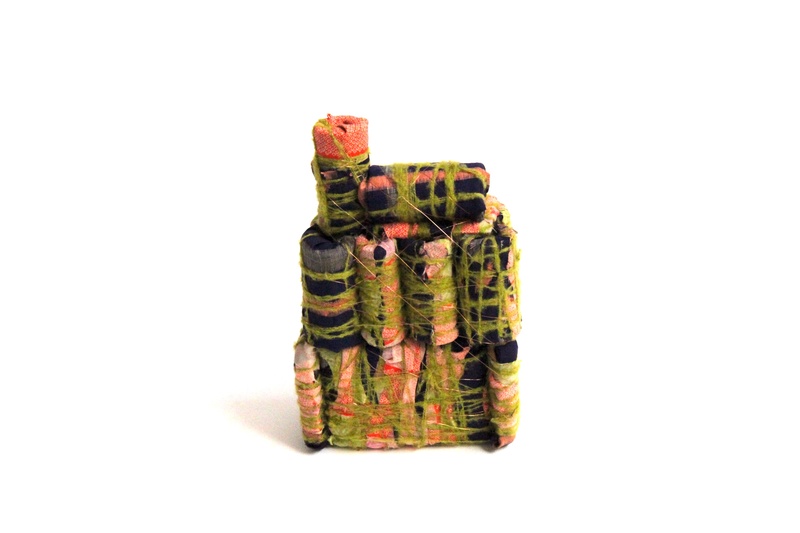 I looked more closely at the meaning of ‘caritas’ – the theme that the Museum has set this year and that interlinks with Fabrica’s own themes which I am exploring. Caritas – is like the notion of charity, but something more – it is loving kindness, altruistic love. It stems here from the story of Saint Martin, important saint in this historically catholic (though now predominantly ‘de-christianised’) City. Seems a bit like St George is to some English people. Saint Martin was a roman soldier, sent off early to war by his father to make sure he didn’t give it all up to become a monk – but gave everything he owned away en route to Amiens anyway. Cathedral is built.) and every French person from Amiens, and farther afield too – knows this story. Except I had never heard of it, which made me feel like a stranger again. Most of my exposure to French historical knowledge was to do the revolution, bastille day etc plus of course all the poets, artists, Paris, etc. I always avoided the Catholic zone, mixing mainly with people from either none or other faiths in Paris. Starting points are slippery things, when your work intersects with so many different areas of knowledge, thought, medium and audience. They have a habit of wandering off and hydra-like, breeding new starting points..But I have to start somewhere, and the term ‘line of enquiry’ was what I was given to anchor me in my intentions for the next four months. This implies enquiry is a linear process, which, knowing the way I process ideas and practices, isn’t a familiar approach. I would say it’s more like a two-way spiral ( a sculptural form I have used a lot). But, given my current practice and its focus over the last decade, the suggestion to respond to and develop more thinking and experimenting on ideas around gift, debt, societal fairness, generosity, equality and altruism some of which I have already spent quite a bit of time considering and informing my work through, was irresistible. Add to that a number of questions – which are very much around right now – considering the role of the artist as contributing agent of social change in times of constraint and upheaval, and I’m definetly already grateful for the time, money and public platform to do so. I love my job. Just responding to one of my proposed lines of enquiry could take up the whole residency, but I like a broad palette, close in colour range, so here we go. I’m excited about preparing for the Unwrapped Event – There’s an ‘I” in Altruism’ at Fabrica on Feb 24th, where I will be one of five speakers. But first, this weekend, with the themes of this event and my own web of questions in mind, I’m being sent to Amiens, France on a four day go-and-see !